Before our big announcement - please let us say THANK YOU dear listeners from the bottom of our heart for supporting us on this amazing journey this past year. We had some big shoes to fill when the previous hosts handed it over but we hope you have enjoyed getting to know Kara and Leah and reviewing the latest news health headlines. Now for the announcement - it is with sadness we announce that Kara has decided to move on from the podcast next year and we wish her all the success with her future. Who knows, maybe she will come back as a guest one time?! Leah has decided to stay on and until the right co-host is found you will able to enjoy a selection of special guest hosts including Shawn Mynar from Keto for Women. Thank you once again for your support and we can't wait to debate and debunk some more health news articles in 2018! Diana Rodgers from Sustainable Dish joins Kara and Leah on this week’s episode of Low Carb Conversations with Kara Halderman and Leah Williamson. Sit back, relax with a kale juice and enjoy this week’s episode! This week on Low Carb Conversations, Diana Rodgers shares information her new documentary called, “Kale Vs. Cow: The Case for Better Meat". Kale Vs. Cow is the brainchild of Diana Rodgers of Sustainable Dish, a real food dietician living on a working organic farm. The film focuses on the most vilified of farm animals, the cow, ultimately making the case that eliminating animals from our food system will cause more harm than good. Contrary to popular media messages that demonize beef, well-managed cattle are one of our best chances at improving soil health and sequestering carbon. Red meat is also a superfood, rich in high-quality protein, vitamins and minerals. Red meat is not the enemy. Diana needs your help! Support Kale vs. Cow’s crowdfunding campaign here! Diana, Kara and Leah discuss an article where by a conference in the Philippines stated that GMO's where in fact, safe. What do you think? Then they discuss an article about Millennial's and how they just don't seem to see the need to cook these days. Do you fall in that category? And do you have a beef with our secret health headline? Author of "Never Binge Again", Dr. Glenn Livingston and Primal Health Coach Rachel Peterson from Austin, Texas join Kara Halderman and Leah Williamson on this week's episode of Low Carb Conversations with Kara Halderman and Leah Williamson. Sit back, relax and enjoy this week's episode! This week on Low Carb Conversations Dr. Glenn Livingston and Rachel Peterson are here to share their health perspectives! Dr. Glenn Livingston is the Author of Never Binge Again (#1 on Kindle for Eating Disorders). As part of his own journey from obesity, 'exercise bulemia' and food prison to a normal, healthy weight and a much more lighthearted relationship with food, Dr Livingston created a unique and unorthodox methodology for helping people to change the mindset behind the behaviors. With it, he helps restore free will, empowering people out from under feeling enslaved to certain foods and triggers. Rachel Peterson is a Primal Health Coach and lifestyle blogger from Austin, Tx. She’s passionate about thyroid and autoimmune health, loves dreaming up healthy delicious recipes and wants to lend support to others going through their own health journeys. Check out her blog! Rachel, Glenn, Leah and Kara discuss a new study connecting eating disorders to autoimmune disease. So what came first: autoimmunity or the eating disorder? Listen to the gusts discuss their opinions! The second article is a study showing we are hard wired to seek out high-calorie junk food from survival instincts. But how do they advise dealing with that? Moderation. See what Glenn and Rachel have to say about that on this week's episode! And remember our secret health headline! 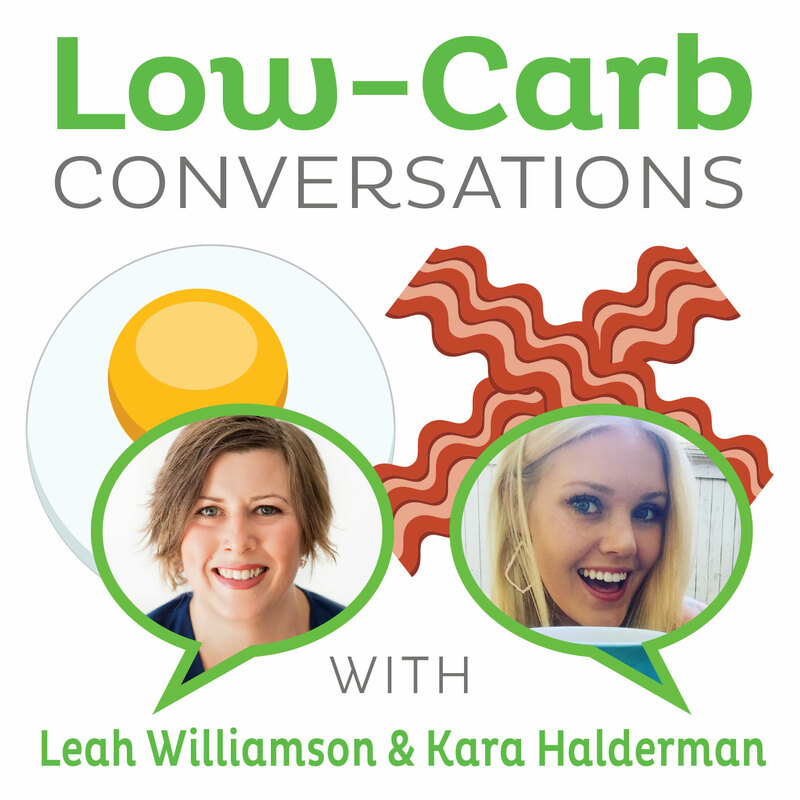 Lauryn Lax, Nutritional Therapy Practitioner and Megan Ellam, Food Blogger join Leah and Kara this week for Episode 248 of “Low Carb Conversations with Leah Williamson and Kara Halderman”. Sit back, relax and listen with a tablespoon of Christmas spice nut butter while Leah and Kara talk with health experts on the latest health headlines! Dr Lauryn Lax shares her journey through an eating disorder and how she turned this into a passion for helping people on their health journey and Megan Ellam shares her passion for low carb cooking found through healing on a ketogenic diet. Kara, Leah and Lauryn and Megan discuss a retraction from the US Food and Drug Federation around soy and it's health benefits. Is this the start of something bigger? We then look at a study on iodine levels. The study suggests iodine is lower on those on a paleo diet. Is it because they are not eating iodine fortified foods such as white bread? Tune in to find out this and more! Oh and hey remember our secret health headline ….it's very festive! The Nutritional Therapy Conference: http://www.nutritionaltherapyconference.com/ - come and visit Kara and I there! The Ketogenic Girl herself, Vanessa Spina joins Leah and Kara this week for Episode 247 of “Low Carb Conversations with Leah Williamson and Kara Halderman”. Sit back, relax and listen with some salami and cheese while Leah and Kara talk with health experts on the latest health headlines! Keto OS Side Effects and Benefits: Is It Worth It? Vanessa Spina, the Ketogenic Girl, is back on the Low Carb Conversations Podcast! Vanessa is a ketogenic coach and educator, creating meal plans, delicious recipes and working with others to help them maximize health and loose weight with a ketogenic diet. She shares with us her story on how after years of chronic pain, fatigue and body image issues, a properly formulated ketogenic diet turned all that around. She even had a new book release on November 7th, Keto Essentials. Kara, Leah and Vanessa debate the new trend of exogenous ketones. Are they the most effective way to burn fat and get into ketosis? Vanessa explains her take on them and how she would rather see her clients make their own ketones and utilizing their healing properties. In the second article, it is explained how cheese and salami are the best foods for our teeth health. They provide the most fat soluble vitamins needed for healthy bones and keep the environment surrounding our teeth happy. Remember our secret health headline ....as if you didn't get enough cheese already! CHECK OUT VANESSA'S BRAND NEW KETO BOOK HERE!! Robyn Johnson, Integrative Nutritionist and Registered Dietician Nutritionist from Kansas City and Lisa Kara, certified yoga instructor and a health foodie extraordinaire from Zinc Nutrition joins Leah and Kara this week for Episode 245 of “Low Carb Conversations with Leah Williamson and Kara Halderman”. Sit back, relax and listen with some avocado toast while Leah and Kara talk with health experts on the latest health headlines! Learn more about Robyn's amazing turn around from guttate psoriasis through functional nutrition and Lisa's bio-individual approach to her thriving practice in Los Angeles. Lisa, Robyn, Kara and Leah discuss an article surrounding moderation, that proposes moderation is the true key to health and success. But with so many different views on what eating "moderately" means, how can that be true? The main points from the article are: extreme diets create all or nothing mentality and unhealthy relationships with food easily persuade audiences. Lisa and Robyn break it all down, and discuss if moderation is truly the answer. Ready for low fat avocados? Leah reads a shocking health headline about new avocados being sold in Spain that have 30% fat. What?! If you're thinking what we're thinking, head on over and listen to the response. Mandy Thomas, nutritionist and financial coach and health influencer and motivational expert, Melanie Miller join Leah and Kara this week for Episode 245 of “Low Carb Conversations with Leah Williamson and Kara Halderman”. Sit back, relax and listen with your budget in hand while Leah and Kara talk with health experts on the latest health headlines! Listen in as Mandy shares her transformational story resolving her severe digestive issues through addressing her finances. She discovered that nutrition is not always the only answer; and she had to take a deeper look at her life to get to the root cause of her problems. Melanie talks about how keto gave her her life back, and eventually went on to start Keto Academy with the one and only Jimmy Moore! Leah, Kara, Melanie and Mandy first discuss a headline related to finances to physical health. Mandy gives examples of how addressing the cause of your stress can resolve the physical symptoms in your life; and gives tangible tips to getting your finances on track. Melanie talks about how she sees stress related illness in her practice all the time and ways to deflect the stress. Leah then reads a conflicting article about which foods are best for warding off hunger. The article pushes that amino acids from animal protein provide the most satiating affect, yet recommends a plant based diet simultaneously. See what they had to say about that one! And remember out secret health headline, it's a sweet treat. Stephanie Dodier, Clinical nutritionist and host of the Beyond the Food Podcast, joins Leah this week for Episode 244 of “Low Carb Conversations with Leah Williamson and Kara Halderman”. Sit back, relax and listen with your mala meditation beads while Leah and Kara talk with health experts on the latest health headlines! This week on Low Carb Conversations Kara is away again so Leah chats with Stephanie Dodier. She was last on the podcast on episode 222 and since then has put together a free 7 day online summit with amazing guest speakers that starts on 1 November 2017. You can find out more about The Beyond the Food Project here or further down. Stephanie and Leah discuss an interesting article on different characteristics of diet personalities. Are they accurate? Which one are you? They then look at different types of complainer personalities and how negativity can rewire your brain. Tune in as it is great chat on all things mindset. Don’t forget our secret health headline. You won't be watching your weight but your health instead. Is it time to ditch the diet mindset? The Going Beyond The Food Project is free and accessible from your own home from November 1st-8th 2017. Register here to Ditch The Diet Mindset, Transform your relationship to food and Feel Good for Good. Kale Brock, Film Maker and Mark Ritz, creator of ritzfit.com joins Leah this week for Episode 243 of “Low Carb Conversations with Leah Williamson and Kara Halderman”. Sit back, relax and listen with your daily probiotic while Leah and Kara talk with health experts on the latest health headlines! Can We Trust Organic Food Imported From Other Countries? This week on Low Carb Conversations Kara is away so Leah chats with Kale Brock. He shares all about his new film - The Gut Movie which is a stunning documentary all about the human gut microbiome. Kale shares some insight as to what is in the film and the fun they had filming. Our second guest is Mark Ritz from ritzfit.com which is a site that gives amazing deals on top quality food items. It’s also a resource to learn more about small companies that are putting out healthy food products that are reviewed by a team of health experts. He shares some of his current clients and the research and testing of the product to make sure it is of the highest quality for you. Kale, Mark and Leah discuss probiotics and since they are a "buzz" word at the moment so do they really live up to what the hype is about? They then discuss the second article which is all about the organic trade business in the US. Can we really trust the organic labelling from other countries? Don't forget our secret health headline. Would you eat tattooed fruit? JOIN OUR FACEBOOK GROUP TO CONTINUE THE CONVERSATION and win some delicious Fat Bombs! Listen in to hear how. Leah uses the amazing essential oil blend – Advanced Focus from Meo-Energetics before podcasting. You should try it too! Check out the No Diet podcast! SPECIAL OFFER for Low Carb Conversations listeners - join https://ritzfit.com/lcc/ and become a member for a year for only $75 instead of the usual $97. Enter the coupon code: LCC22 on checkout. Emily Schromm, Nutritional Therapy Practitioner, certified personal trainer and CrossFit Coach joins Leah and Kara for Episode 240 of “Low Carb Conversations with Leah Williamson and Kara Halderman”. Sit back, relax and listen with smoothie before 9am while Leah and Kara talk with health experts on the latest health headlines! And remember our secret health headline. It's a stinker. ​The EmPack: ​The fully functional backpack that doubles as a weight training pack. Free your fitness. Please use the code EMPACKLOVE for 10% off any EmPack. Don't forget to check out the 6-week training program that was written specifically for the EmPack. EmFit Get Strong: Busy Bee! Ashley Sweeney, Registered Dietician and Food & Nutrition expert along with Katy Smith, Nutritional Therapy Practitioner student joins Leah and Kara for Episode 241 of “Low Carb Conversations with Leah Williamson and Kara Halderman”. Sit back, relax and listen with a keep cup of coffee while Leah and Kara talk with health experts on the latest health headlines! This week on Low Carb Conversations Ashley, tells how she battled with deep issues in her relationship with food and overcame these to become a dietician and help others. Katy shares her health journey that started from a young age and how she is now studying to become a Nutritional Therapy Practitioner to also help others. Ashley, Katy and Kara and Leah discuss whether new organic Doritos are healthier for you. Is this more health washing? They then discuss food wastage and some strategies to avoid this. Check out the links section for all the cool ideas mentioned. And remember our secret health headline. Is it really good for you?